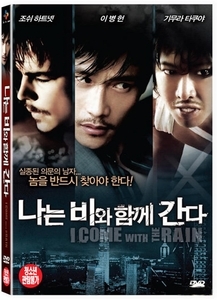 I Come with the Rain is a 2009 neo-noir psychological thriller written and directed by Vietnamese-born French director Tran Anh Hung, starring American actor Josh Hartnett. After making three movies about Vietnam (The Scent of Green Papaya, Cyclo, The Vertical Ray of the Sun), Tran Anh Hung intended to make a baroque action film, a passionate thriller, both intense and poetic, haunted by three characters from the mythology of film and the Western world: the serial killer, the private investigator, and the Christ figure. The music is written by Academy Award Winner Gustavo Santaolalla and the English alternative rock band Radiohead. The action takes place in Los Angeles, Mindanao (Philippines) and Hong Kong and allows the meeting of Western and Asian actors. Two years after killing Hasford a serial murderer in the line of duty, Kline now works as a private detective, but he is still haunted by the ghosts of his past. A powerful pharmaceutical conglomerate boss hires Kline to find his only son Shitao who has mysteriously disappeared in the Philippines where he had been helping in an orphanage. Kline follows the trail left by the ethereal Shitao to the jungles of Mindanao, and then to the urban jungle of Hong Kong, where he enlists the help of Meng Zi, an old police officer friend. The search leads Kline to cross paths with local organized crime syndicate boss Su Dongpo, who is making trouble for the underworld, triggered by an overriding passion for his drug-addicted girlfriend Lili. Caught in the crossfire between the Hong Kong police and Su Dongpo's mafia drug ring which is also hunting for Shitao, Kline found himself alone, in this unknown city, when Meng Zi is victim of an assassination attempt and hospitalised. Leaving behind his 5-stars hotel for a shabby murder scene apartment in order to get inside the mind of Shitao, Kline gradually loses himself in the terrifying memories of Hasford, whose speciality was dissecting his victims' limbs while they were still alive, then reassembling them into installation sculptures.